Nebraska’s annual spring game serves many purposes for the team and fans alike. That includes evaluation of players at key positions, getting a fix of football before fall and, of course, the chance for recruiting prospects to experience a little of what a Husker game day is like. The latter reason has become a hot topic so far in 2017, with more than 30 visitors expected for the 2018 class and almost 10 for the 2019 class. More than that, the list includes a heavy focus on 4-star recruits. That alone has Nebraska fans excited, but the question remains: Will those prospects ultimately choose the Huskers? Coach Mike Riley was hired at the end of the 2014 season, putting him and his staff in a bit of a tough position on the recruiting trail. They chose to focus more on retaining the 2015 class versus recruiting ahead for 2016 and 2017. That meant the 2016 class visitors for the 2015 spring game weren’t exactly a bright spot for Riley. Instead, his 2017 class visitors were a better indicator of what was to come. LB Chris Baccus – A junior college transfer from Northeastern Oklahoma, he ultimately took a greater interest in Louisville. OL John Raridon – A verbal commit at the spring game, he signed with Nebraska. TE Jared Bubak – A verbal commit at the spring game, Bubak decommitted from Nebraska and signed with Arizona State. A quick review shows that the 2015 spring game was not Riley's most successful in converting visitors to signees. By the time national signing day rolled around, the Huskers had successfully signed only one player for the 2016 class that visited for the spring game – Raridon. The situation was understandable given the time frame Riley and his staff had, but they knew they needed to move faster as Riley explained on national signing day in 2016. Riley did make the most of those 20 days in 2016, compiling a solid group of visitors for the spring game. That included Johnson, who had also visited in 2015. While Roberts didn’t make a repeat trip, Riley’s success rate with the 2017 group started strong with the 2015 spring game (signing two out of the three). QB Tristan Gebbia – A verbal commit at the spring game, he signed with Nebraska. WR Keyshawn Johnson Jr. – A verbal commit at the spring game, he signed with Nebraska. 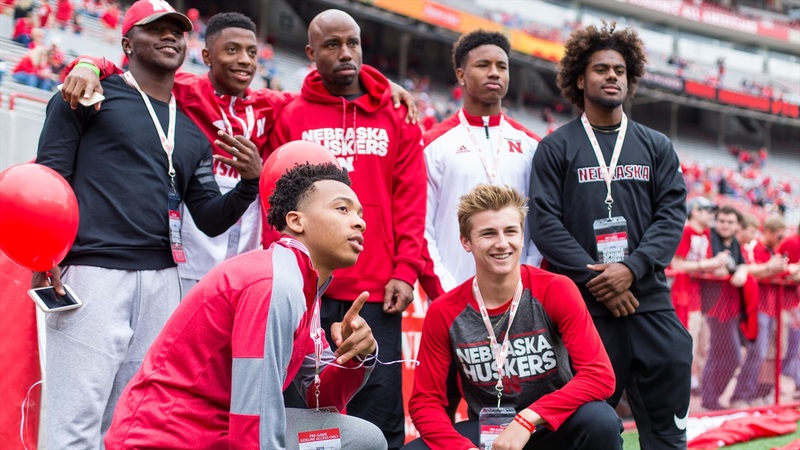 WR Jaevon McQuitty – A verbal commit at the spring game, he signed with Nebraska. TE Austin Allen – A verbal commit at the spring game, he signed with Nebraska. Looking at just the 2017 recruiting class visitors, Riley and his staff were able to close on nine of the 21 visitors. That is a 43 percent success rate for the 2016 spring game with that class alone. Add to that Jurgens , who is already committed, as well as Farniok and Radley-Hiles, who are considered to be heavy Nebraska leans, and the spring game success for Riley is considerably higher than it was during his first spring. The data surrounding Riley’s recruiting and the spring game is still limited, but the 2017 spring game will provide more context come the 2018 signing day. If Nebraska ends with at least 30 visitors on April 15 and roughly 40 percent commit, that’s the start of a positive recruiting trend for Nebraska. For now, it’s all hypothetical. It’s also too early to make any assumptions on trends but what the 2017 spring game can provide is a better outline of what Riley said he wanted to do on signing day in 2016 – earlier evaluations so relationships can be formed. When that happens, the commitment percentage would be expected to grow.